The two brothers were quick to realise the potentials of the export market and the business grew rapidly. George went to America to set up the sales market. James remained in England and managed the pottery works and the shipping. The canal is the Caldon. The business grew so well that a new factory was built on the side of the Caldon canal and so the Eagle Pottery was built in Hanley in 1859. 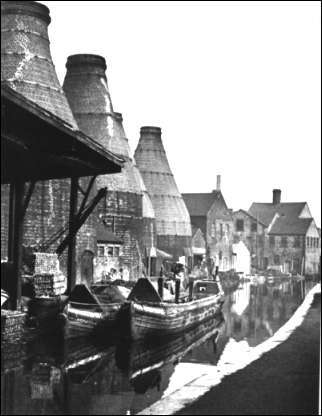 Potteries were often built on the canal side so that the raw materials could be brought in and finished ware could be taken to Liverpool for export. Later the Eastwood works were purchased which was founded by another brother, Charles. Meakin's main product was white granite dinner and tea ware. The 'Wheat Design' with its embossed wheat-ears and leaves was an early favourite, since it was both tough and elegant. Meakins remained a family form for 100 years and earned a reputation for treating its employees well. The firm donated £5000 towards Hanley Park (1892-7), land for the former St. Michael's Church and provided the Organ for the Victoria Hall, Hanley. 1968 Meakins joined with Midwinters. In 1970 they were taken over by the Wedgwood group. The Eagle factory still operates today producing everyday tableware. The story of J&G Meakin starts well before the brothers opened their pottery in 1851, their father James Snr born in 1807 died 1852 started potting some years earlier in Longton before moving to Cannon St Hanley in 1850. In 1851 he was due to ill health succeeded by his two sons James and George who formed what was to be a long and successful partnership we now know as J & G Meakin Pty Ltd. 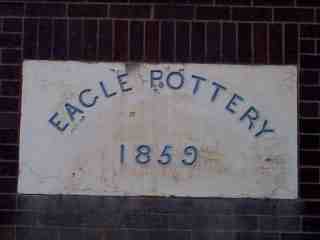 The brothers stayed only one year at Cannon St before moving the factory to Market St where they stayed for 7 prosperous years, on its completion in 1859 they moved to the now famous Eagle Pottery. The Eagle pottery was bold and visionary, well in advance of its time. Erected on the moorlands on the outskirts of Hanley with good access by canal to the Mersey ports. In 1887 J & G purchased the Eastwood Pottery from brother Charles Meakin, now becoming the largest potting company in Britian. Their aim was to provide an attractive and strong china with distinct patterns made for the tastes of the individual markets that they serviced. The majority of Meakins wares were made for export to the USA and British Empire Colonies. We know from industry periodicals of the time, that the Meakin factories were at the cutting edge of technology of the day, and that from the first day of production in 1851 the factories were continually upgraded until in the 1950's they had achieved production of over 1 million pieces per week. SOL Brand became a popular favourite in Australia, NZ and the USA with patterns such as "Celeste", "Rosa", and "Sunflower" these patterns being produced with no embellishments due to wartime restrictions in force in Britain at the time. After the war pictureware patterns were produced with patterns varied to suit the intended export destinations. In addition to the many beautiful patterns, in 1951 their centenary year Meakin produced a range of commemorative wares, these wares along with their pictureware series have now become highly collectable.